Now that the NBA has authorized the placement of ads on player jerseys, it's time for the church do go and do likewise. I have no problem asking the Altar Guild to sew enough patches on my chasubles to make me look like Dale Earnhardt, Jr. Instead of Penzoil and STP I'd imagine ads for companies more relevant to churchgoers. Like fill-in-the-blank non-profit agencies or Christian dating sites. Perhaps this would be driven by the season. During Advent, I could hook Amazon and some of the other big national retailers like Macy's. And Easter would be all about Peeps and Honey Baked Ham. While Ordinary Time might leave me stuck with the local gas station, I could charge top dollar for Christmas Eve. 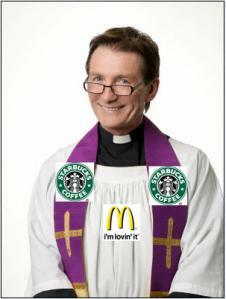 What company wouldn't want to advertise their Post-Christmas Sales on the front of my vestments? As I reflect upon this new model of monetization, other ideas come to mind. The Eucharist could be co-sponsored by Ernest & Julio Gallo and Wonder Bread; the flowers by FTD; the fair linen by the local dry cleaning place. Coffee Hour is an easy one: "Now that you've been to God's house, welcome to Maxwell House." Finally, I don't want to discount the impact of product placement. For a price, I'm happy to mention certain products in my sermon: "When the disciples pulled up their nets they were full of fish. Speaking of fish, don't you just love Gorton's Fish Sticks?" or "Then they came to the place that is called the pavement, or in Hebrew Gabbatha. Did you know they're having a sale on paving stones at Home Depot? It's true and they're open on Sundays." Plus, with liturgical product placement in mind, I can do baptisms with water provided by Poland Springs; anoint with chrism sponsored by McCormick Spices; and fire up the thurible with Kingsford Match Lite briquets. Yes, I've just single-handedly solved the economic crisis in the Church. Tell your vestries to stop worrying about money and start thinking creatively about mission. Well, after they finish selling the ad space. This a bloody riot. Thanks for posting it. Crucifixion lumber and nails provided by Lowes? With everything else Churches do like the world, this might as well be one of them. Get a grip, man--I thought you were Episcopalian!